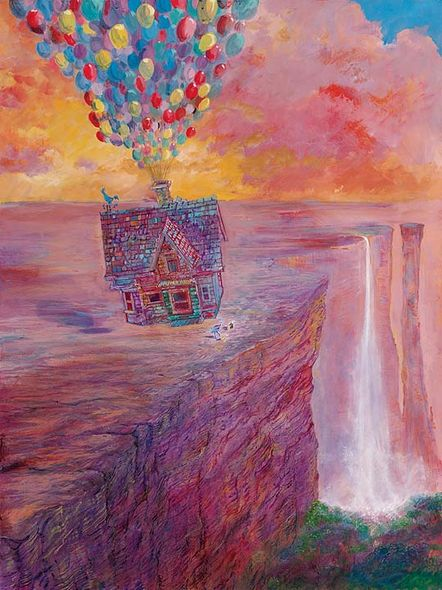 Home | Disney and Animation Art | Pixar | The Pixar Collection | Harrison Ellenshaw | Harrison Ellenshaw Signed and Numbered Hand-Embellished Giclée on Canvas: "A Promise Fulfilled" OFFICIAL | Gallery Direct Art | 800-733-1144 Free Ship. No Tax. Harrison Ellenshaw Signed and Numbered Hand-Embellished Giclée on Canvas: "A Promise Fulfilled"
About The Artist:Many sons growing up in the shadow of a famous father feel that they want to carve their own paths in life. That was me, says Harrison Ellenshaw, son of Disney Legend and master painter Peter Ellenshaw, who won an Oscar for his visual effects work on "Mary Poppins and was nominated a total of five times for the Academy Award. I had grown up fascinated by my father's painting." Harrison says. He would sometimes give me canvas and paints. I have photographs of me painting when I was a small boy. My father's life was painting, even during meals he would bring the canvases he was working on into the kitchen and sit and eat and look, criticizing his own work. My mother was not always pleased that this was how the family spent mealtime, but she understood his passion. But I found both this passion and his incredible talent intimidating. I was convinced I could never live up to any of it. Home | Fine Art Prints & Limited Editions | Collectors Editions | Disney Fine Art | Harrison Ellenshaw | Harrison Ellenshaw Signed and Numbered Hand-Embellished Giclée on Canvas: "A Promise Fulfilled" OFFICIAL | Gallery Direct Art | 800-733-1144 Free Ship. No Tax. Home | Disney and Animation Art | Disney Fine Art | Harrison Ellenshaw | Harrison Ellenshaw Signed and Numbered Hand-Embellished Giclée on Canvas: "A Promise Fulfilled" OFFICIAL | Gallery Direct Art | 800-733-1144 Free Ship. No Tax.